Battery-powered outdoor equipment manufacturer Ego Power+ is taking its snowblowers out of the lab and putting them into the most extreme real-world conditions to show off their capabilities. 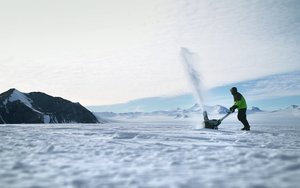 A new advertising campaign from Chicago agency The Escape Pod takes the Arc Lithium battery-powered snowblowers to Antarctica to demonstrate how much more reliable they are than gas-powered machines. “Unlike gas-powered snowblowers that never start when you need them, these start first time, every time,” says Vinny Warren, creative director at The Escape Pod. The commercial describes the frozen continent as “the coldest, windiest, most hostile environment on Earth.” In the middle of nowhere, and away from anything that even remotely looks like civilization, a lone person turns on the Ego Power+ snowblower with the simple push of a button and begins blasting snow into the air. “This is power, beyond belief,” a voiceover concludes, enunciating the brand’s tagline. Ego's previous efforts for its lawnmowers and leaf blowers have shown the products being used in a lab environment and faring competitively or better than their gas-powered counterparts. Despite moving the new campaign outdoors, it maintains the previous effort’s spirit, Warren says. In addition to the commercial footage, which will be used in digital, television and social channels, the team shot footage for potential use by exclusive retail partner The Home Depot, for use on social channels as well, Turoff says.